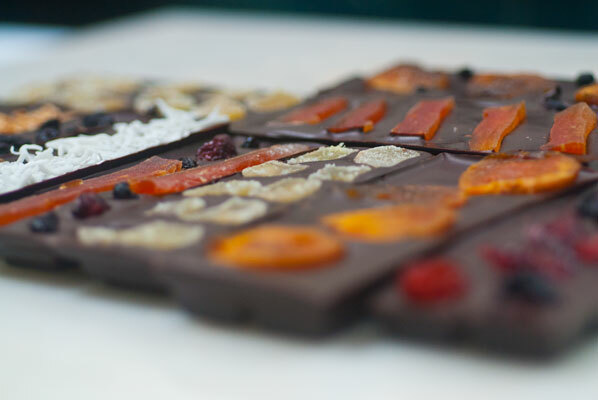 I think it was looking at, salivating over and finally tasting those wonderful chocolate bars at The Chocolate Tree, in Edinburgh, that made me want to try creating my own. Perfectly tempered, glossy but unassuming on one side, when flipped over, they are a pretty picture of jewel-like fruits and roasted nuts. It must be confessed, the idea of placing these items on the chocolate, rather than suffering again through my late, ham-fisted attempts at enrobing, really strikes my fancy, this week. I also have some very cool new bar molds (I loves me my molds) which I can’t wait to try out. These bars will be, in effect, rectangular mendiants, which are traditionally in disc form. 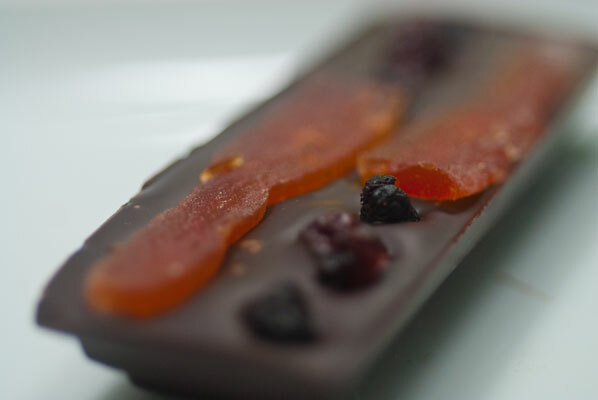 A mendiant is a traditional French confection composed of a chocolate disk studded with nuts and dried fruits representing the four mendicant or monastic orders of the Dominicans, Augustinians, Franciscans and Carmelites. Each of the nuts and dried fruits used refer to the color of monastic robes with tradition dictating raisins for the Dominicans, hazelnut for the Augustins, dried fig for Franciscans and almond for Carmelite. 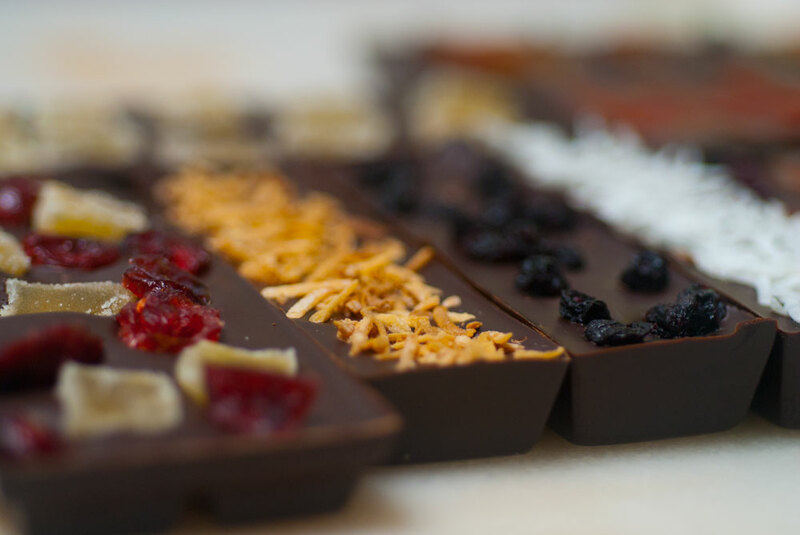 Usually found during Christmas, recipes for this confection have veered away from the traditional combination of nuts and fruits to other combinations incorporating seeds, fruit peels and other items. Other items, in our house, could mean cat hair if I am not careful, so I banish the furry friends outside, and set to work preparing my kitchen “zone”, washing everything down with hot water, no soap, and towel drying every last bit of moisture from utensils, bowls, Silpat mats, molds and counters. 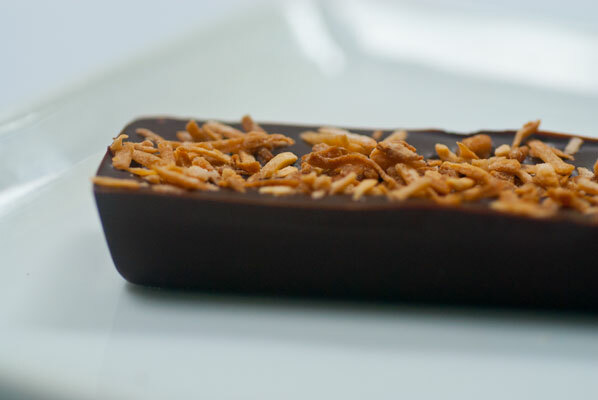 I return once more to the Ecole Chocolate curriculum, and re-read with reverence, the steps on tempering with seed chocolate. They are clear, precise and logical. I chant them to myself until I think I know them by heart (again), but keep the laptop close by, just in case. I have decided to temper this way today, as it has been quite a while since I have done it, and my last tabliering effort was a bit iffy. It could be because I was talking while moving the chocolate around on the marble slab, then scraping it into the waiting bowl. 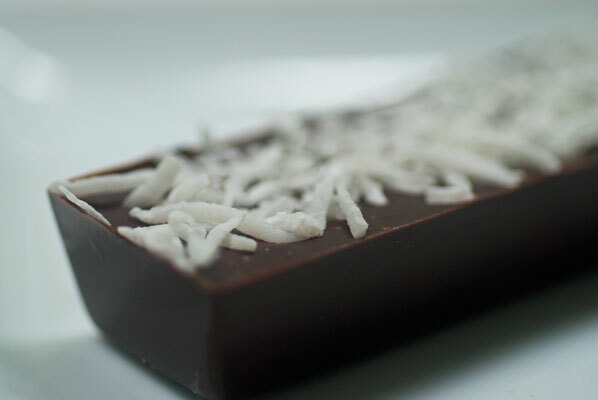 In my distraction, I allowed the chocolate to fall out of temper and get too hot because once I had it in temper, I put it back over the bain marie to keep warm, but the simmering water was too hot, thus melting all those nice V-form crystals I had worked so hard to create! 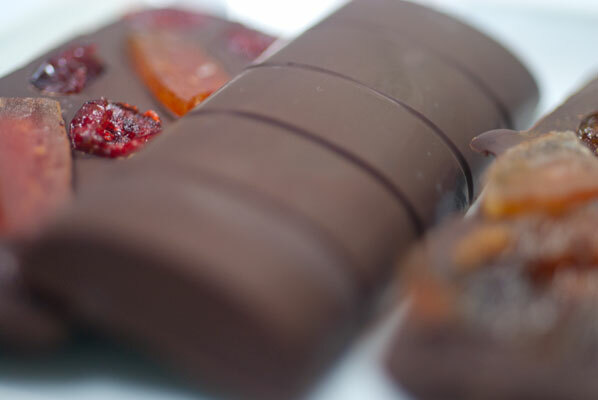 The enrobed pieces did not have the nice snap and gloss of well-tempered chocolate. 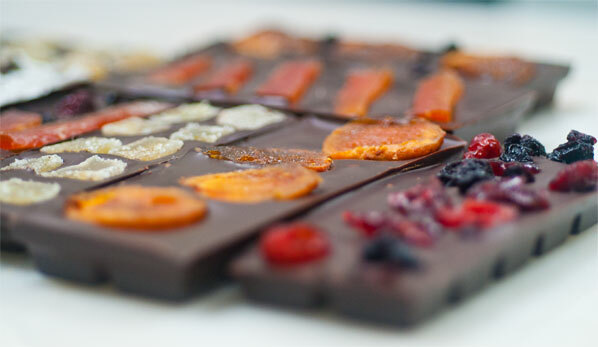 I am absolutely determined to do better today, and I am meticulous in my measurements as I weigh out the chocolate in a “20% for seed, 80% to be melted” ratio. All goes well until I have got most of the seed chocolate in the mixture. I feel a definite thickening of the chocolate and my arm is wearying of the constant stirring. I keep checking the temperature, and while it is decreasing, this happens in very tiny increments. I fear I will have shards of unmelted seed chocolate churning around with my melted chocolate. 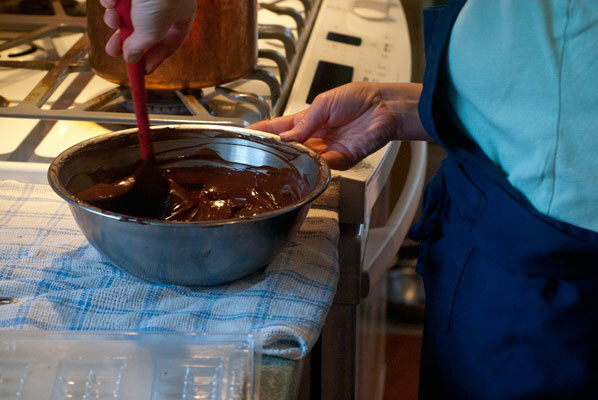 I get the last of the seed chocolate in, put the bowl over the bain marie for the briefest of moments, and the whole thing melts nicely together, and I am ready to do a temper test. Except, I have forgotten to take the fruits out of their bags and to slice them into small pieces. 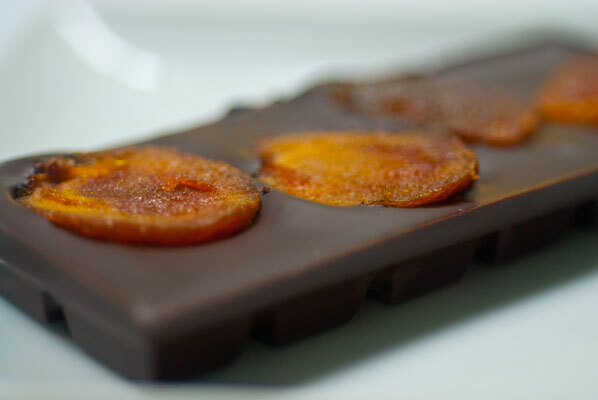 There follows a frantic five minutes, as I race around, sharp knife flying, slitting across dried organic apricots to lay them open in thin circles (no easy task, I must say as they are very squishy), slicing dried papaya into spears, and candied ginger into translucent squares. 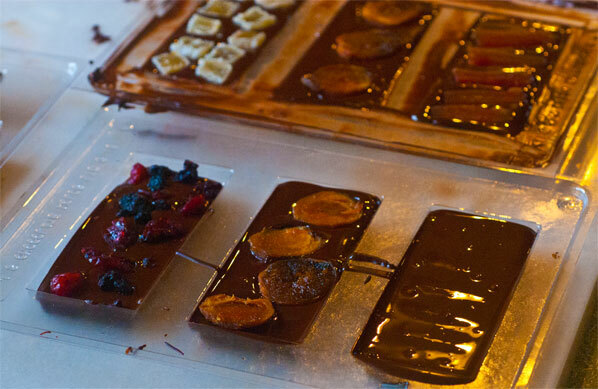 The chocolate appears to be in temper still, and in it goes into the molds. 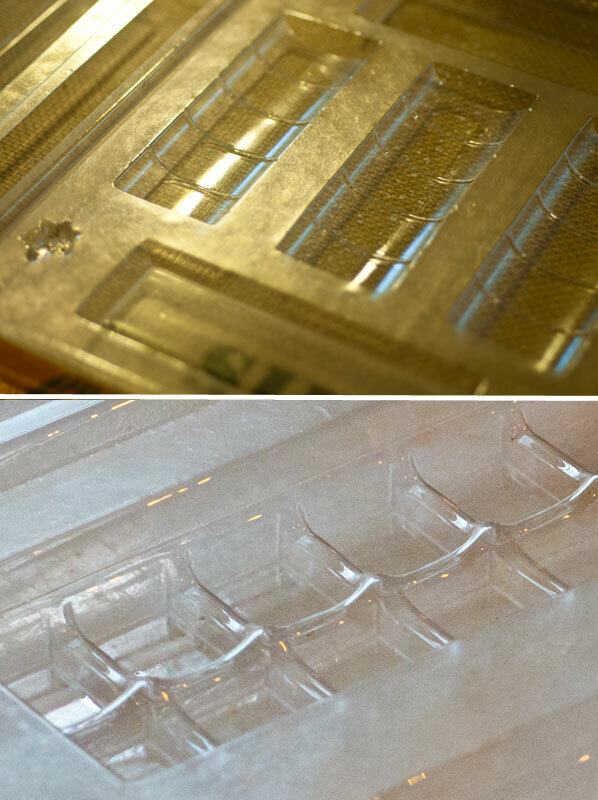 These molds are made of thin flexible plastic, rather than the professional rigid polycarbonate ones I have been used to, and the technique in filling them is, I am now realizing, quite different! With these ones, what ends up working for me, is to pour the chocolate into the centre of each well, to slightly under-fill them, then shake the mold back and forth slightly to get rid of air bubbles. 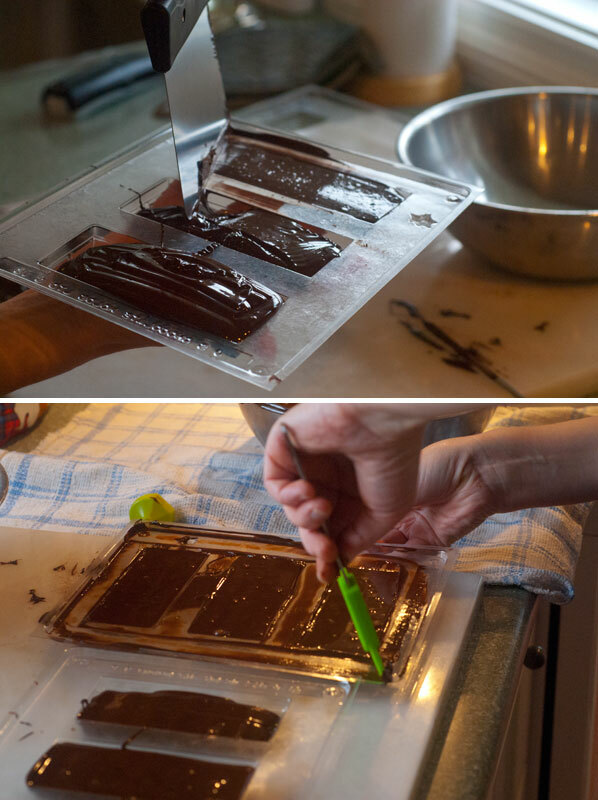 This leaves me with room to place additions on top of the bar, and to have them sink slightly into the chocolate, without the mold overflowing. I try various combinations, in my head composing how they will taste together, but really, going more for colour and texture. I have to resist the temptation to overcrowd my “canvas”, and I believe I show great restraint, in one instance allowing a mere four papaya spears to adorn the back of one bar. I have put the small amount of chocolate I have left, after filling three molds, back over the bain marie, and now realize I have enough for three more small bars. 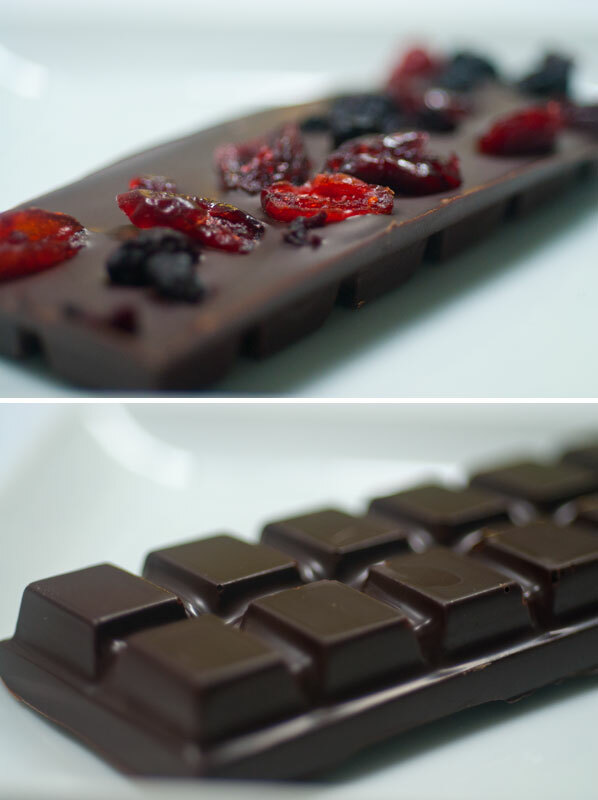 I quickly pour the remaining chocolate into these molds, fearing the worst – that the chocolate has become too hot and fallen out of temper. I clean up, put the molds to rest and harden on a marble slab, and prepare dinner. 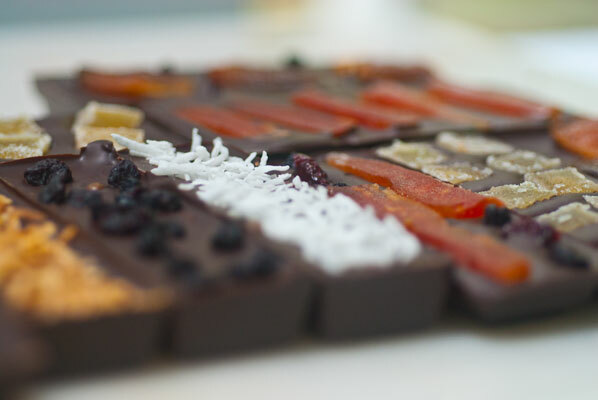 I am delighted to hear the sweet sound of slight cracking, as the chocolate sets, and pulls away from the sides of the molds. 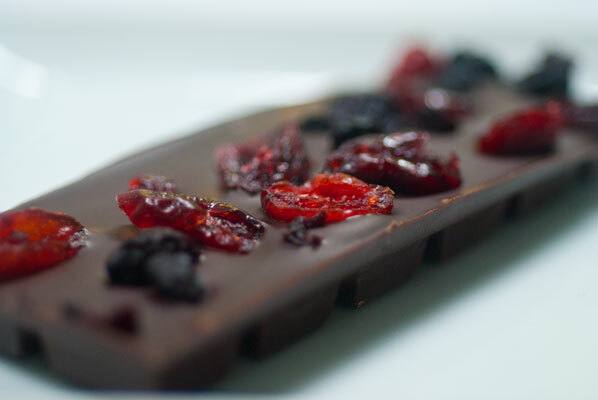 In a couple of hours, I am able to flip the molds over, and out pop three sets of glossy well-tempered chocolate bars (and three small, dull ones – see image #4 in the gallery at the bottom of the page). I am exhilarated. They look so pretty, and I can feel my confidence returning. I know exactly what I did correctly, and exactly where I let my concentration slip, and screwed up. 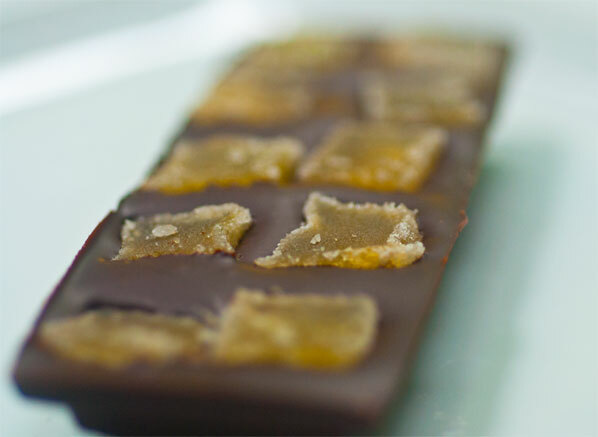 And I feel like I want to get back at it, and make another batch of bars. I have an idea for ones involving homemade lemon marshmallows, and candied orange zest. 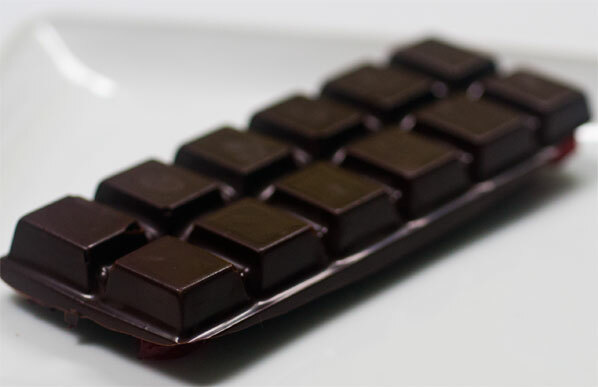 Ahhh, the chocolate life is sweet.